Unfortunately for Lucy Barnett's team, their run was halted in the final of the National Intermediate Cup, denying them a league and cup double and the chance to end 2018/19 with a 100 per cent record. 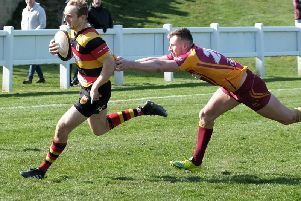 Yet, Barnett insists that nobody at the club is too downbeat about Sunday's 24-10 defeat to Old Albanians Saints at Derby RUFC. "Obviously we wanted to win the cup, it would have been the icing on the cake, but we're not disappointed or disheartened," she reflected. "The girls were amazing, they gave absolutely everything on the day and I couldn't have asked for any more from them. "We've had a fantastic season and we've lost one game out of 22, which isn't a bad effort. "It's a shame we couldn't finish with a win, however we'll learn from this and it's provided a bit of an insight into the challenges that lie ahead next season. "To be honest, we were honoured just to be there in a national cup final. At the start of the season we'd never have even dreamed of that." Although Old Albanians ran out victorious by a 14-point margin, team manager Barnett believes that 'Gate could easily have won the game. "It was closer than a 24-10 scoreline suggests. Take nothing away from Old Albanians, but the match really could have gone either way," she added. "It was a fantastic contest. The best game we've been involved in all season against a very good side with some strong players. "We were camped in their half for long periods in the first half but just couldn't quite get over the line. We had a lot of scoring opportunities and two or three times we got so close and then fell just short. "I have to say well done to Old Albanians on the win, but also to our players who gave 100 per cent. I'm so proud of them all."